A Child’s Prayer | T.O.T.E. We started slowly. In the beginning, Andy or I would take her hand and make the sign of the cross before and after prayer, and she quickly learned to hold her hands together. She (usually) sits quietly and bows her little head. We all sat down to supper several nights ago, and Andy and I were engrossed in conversation (we’re starting a house-hunt for our very own first home! but those details are better left for another post). Between pointed questions and concerns, I had already taken several bites of whatever was on my plate when suddenly Andy and I both looked at Mo in her high chair. 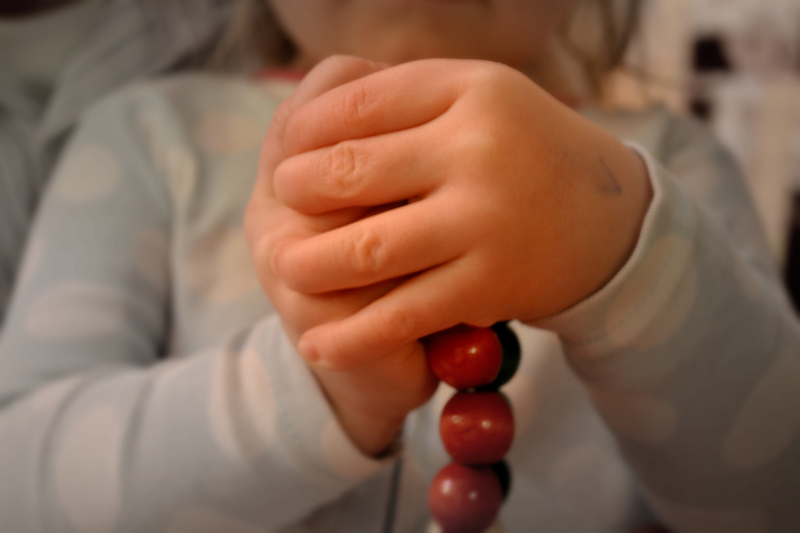 She just sat there, eyes wide, hands tightly clasped, with a small expectant smile, waiting for prayer. We laughed. We couldn’t help it. She was just so cute, and so right! We controlled our giggling fit and then started in: “Bless us Oh Lord…”. At “Amen” Mo fervently crossed her hands from shoulder to shoulder about a million times till we told her “Good job!” and then we dug in to food and conversation for real. What a beautiful vessel for God to remind us of the power and import of prayer. Not to mention, the memory still makes us giggle. This entry was posted in Uncategorized and tagged Mo Story. Bookmark the permalink. I actually squealed when I read that. You are amazing parents. Pingback: Video Update | T.O.T.E.